It has been almost seven months since my once-in-a-lifetime West Coast Breeders’ Cup pony rider adventure. The person responsible for making that dream come true was Karen Headley, daughter and assistant trainer to legendary trainer Bruce Headley. 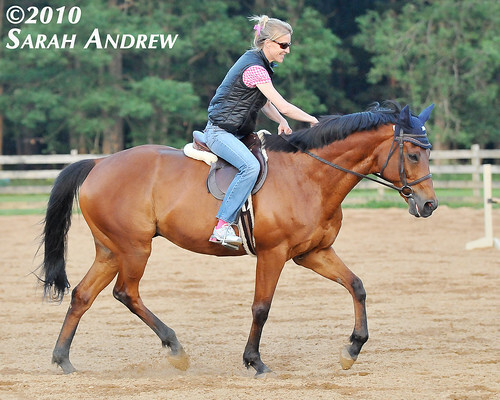 This week, Karen was on the East Coast and she paid a visit to the barn and took a little spin on Wizard. I was admittedly a little self-conscious about this visit. I have the utmost respect for Karen and her family, a group of great horsemen and horsewomen. Karen has ridden and worked with horses of the highest caliber and I was a little nervous wondering about what she would think about how I rode and the horse I was riding. The weather was warm and Wizard was quite low-key for having a week off from work. I rode him first, warming up at a walk and then doing some trot work. I took a few pointers from Karen about cantering and picking up the correct lead and they were quite effective on Wizard. I dismounted and Karen rode Wizard for a few minutes. She is a beautifully tactful rider and I could see Wizard respond to her immediately, with a relaxed topline and a soft connection to the bit. He was a happy horse. Karen liked how responsive Wizard is to seat and leg. She smiled, gave him a pat (photo above), and dismounted. It was a proud day- all this work is paying off in so many ways. They really clicked, even in a short ride. you hang with some high powered peeps woman! Love the photo…the smile, the easy movement of the horse…. He looks like such a sweetheart! Does his personality match his looks?